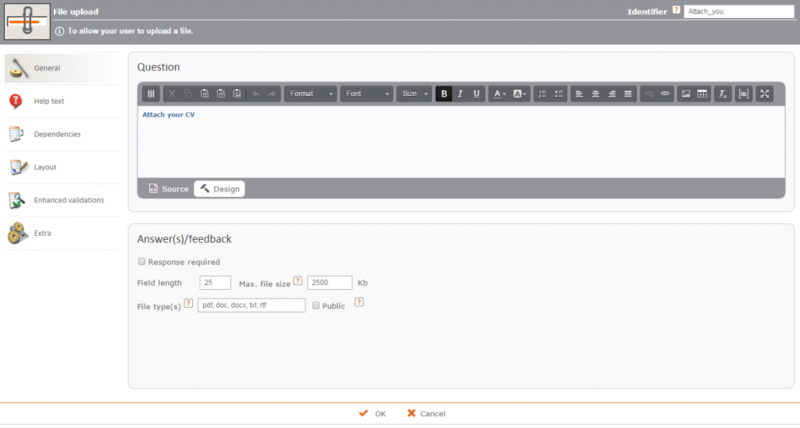 You can include a ‘Browse’ button in your form with which the user can upload and attach a file. This could, for example, be an image or a document. In the settings, you can determine whether or not the file is public. Public files can be opened outside your Formdesk account. For example, maybe you would like to display an attached image in the overview of published results. You can specify the maximum file size in Kb. Formdesk uses a special script that makes it possible to upload very large files (100 MB+). Additionally, it is possible to downscale an image to a specified size. The demo form concerns a job application form, where the résumé can be sent as a separate file.